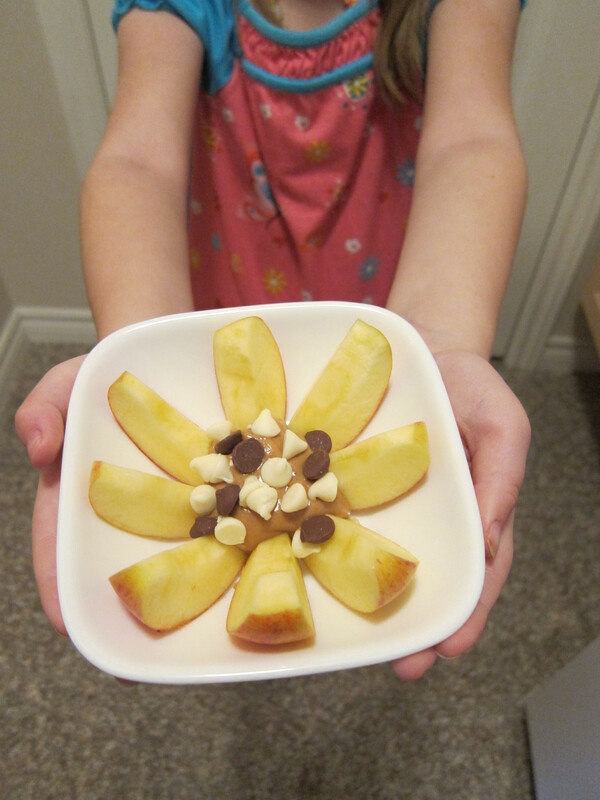 Did you know you can cut an apple almost all the way through, pop out the core, let the flower petals fall open, then add a dollop of peanut butter and a few mini chocolate chips, to make a delicious and nutritious sunflower? Isn’t that fun? It is a favourite around here, especially in Fall, when the Nova Scotian apples are at their absolute best. Delicious! You can use what you like best, of course, but I tend to use a Golden Delicious Apple, Natural Peanut Butter*, and gluten free mini chocolate chips. You only need a few chocolate chips. They are chocolate chips! They seem to have a magical power over kids. If they find 2 in a mini muffin they’re thrilled, so I just go with what I have worked so hard to achieve. Happiness! So, what do you think? 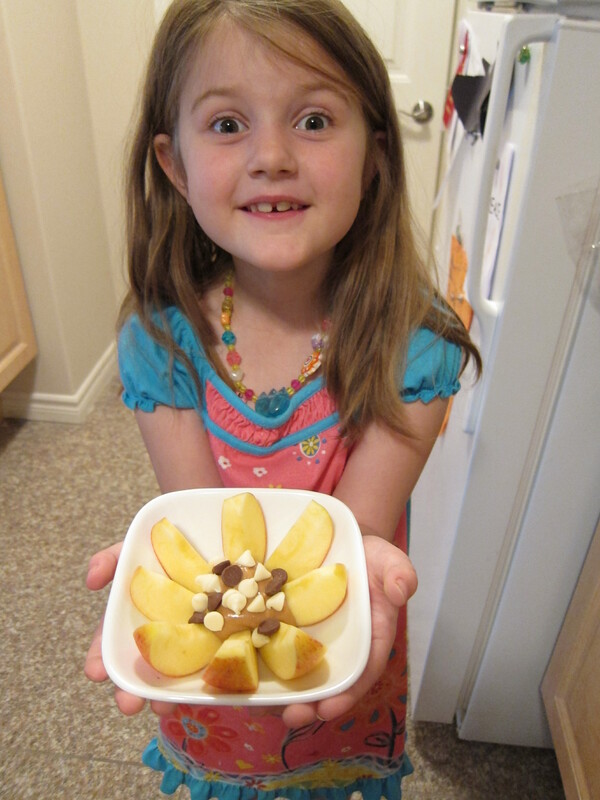 Do you think your kids would like to try a Sweet Sunflower Snack? I am willing to bet they would. What is your favourite snack food? Do your kids have special snacks after school? If you give this a try, I’d love to hear what you think. Oh, just one more thing! I nearly forgot!! 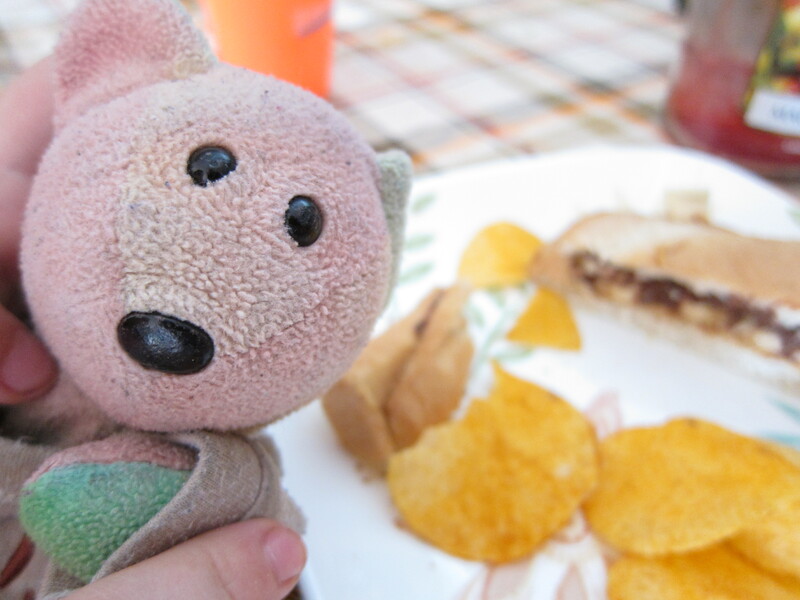 It’s a teeny tiny Thing 2 enjoying a Sweet Sunflower Snack a few years ago! Aww! This small Corelle bowl might be the ideal serving dish for this snack. Notice how it helps the apple slices keep the flower shape, while containing the Peanut Butter? That’s better than the larger plate for presentation. (Though the larger plate was best for an after school snack with extra Things!) I also like the mix of white chocolate and dark chocolate chips here. It seems more flower-like, to me. *Of course, if you have a peanut allergy you can use another nut butter or a soy butter in its place. Still yummy! Saturdays are pretty casual at Chez Peady, but we have a few things we tend to do on any given Saturday when we are in town. The Things are not currently enrolled in any extracurricular activities on Saturdays, so they tend to have a fairly relaxing morning. They might read or have a bit of TV or CPU time for a little while and, after a while, typically the topic of cleaning will be brought up by Daddy-O and they vanish like, well – like clean in a kids room! There are a million great reasons to tidy a Thing room. In that there are a million things that need to be picked up off that darn floor and put away, donated or tossed. And yet, today just didn’t seem like the right day to push it. Thing 2, clearly got wind of a forthcoming fumigation because she decided to sleep in. It was an avoidance tactic, obviously, but I know my kiddos and it was also a clear sign that she was feeling stressed about stuff. It’s funny, you know, stuff can really bog a person down. Even a teeny Thing-like person. They are always so relieved and relaxed once the annual pre-Christmas purge happens, but there’s no need in stressing them to the max in order to create calm. It sort of defeats the whole purpose of the exercise. Thing 1, was happy to hang out with Daddy-O and play some computer games while I went off to Zumba (which was awesome, by the way) to dance away my stresses. He has an interesting set of avoidance skills, himself, mind you. He can organize his books for hours, but the closet floor will remain carpeted with a week’s worth of clothes. It’s enough to make a mother consider a rather pricey investment in that caution tape the police use to keep people away from crime scenes. No. Today was a day of doing as little as possible and doing it with enthusiasm. Usually, Saturday’s lunch is left over pizza from Friday Family Fun Night, but last night’s was so yummy the Things ate the whole pie! It was a simple Pepperoni & Cheese pizza and they were hungry Things! So, leftover pizza was out. It seemed the kind of day that a fun lunch was in order, so we came up with the following meal. Brace yourself. No really. I mean it. Go eat some kale and have some cucumber water to prepare yourself for the forthcoming information. 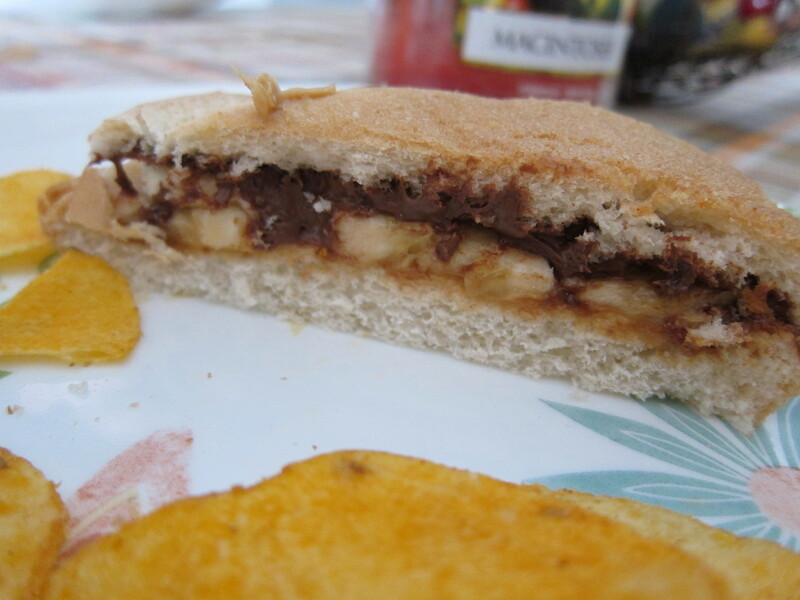 This is a Peanut Butter, Banana, and Nutella sandwich – on WHITE bread! With BBQ chiptonite on the side. I didn’t even know there was white bread in the kitchen. I never buy it. I suspect it was purchased by mistake. But seriously, if you were a kid who typically eats lots and lots of healthy meals (especially on school days, by the way, because it really is important) wouldn’t this make you happy? *Is it any wonder ESL students get confused? **This is the way BB has started speaking. We have no idea why she started speaking, at all, actually, but the voice – hoo boy. The Things do a voice and well, this is what she sounds like. It’s “adowabow” and extremely irritating at once. BB often gets up to shenanigans at Chez Peady, but her breakfast capers are what drive the parents the absolute most bananas on any given day. 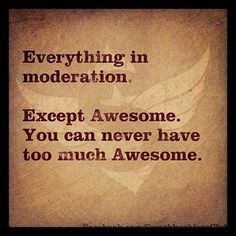 Especially if BB speaks prior to the coffee pot *beep*.